I have smelled the scent of skunks wafting in through my open windows at night in our home, every summer for the past 28 years; but last night was the first time the scent was so strong that it made me ill. In the wee hours of the night, I woke in the dark, to my second-story bedroom filled with the acrid smell of skunk spray. My first reaction was a bit panicky as it was so overwhelming. I immediately shut the window and tried to go back to sleep. In retrospect, I should have immediately done more to air out the room through the door and the hallway window. I am not sure if I got back to sleep, but about 45 minutes later, my abdomen started cramping up and I spent the next hour in the bathroom. I knew I was sick from the skunk spray. I used all the healing tools I could; I did my Inhale Light protocol and breathed out shock and trauma, I inhaled light and exhaled skunk spray remnants, I also opened up an emergency MAP coning to help me deal with the physical and emotional upset, I asked my angels to help me and I did Reiki on my abdomen. I was eventually able to go back to bed and slept for a few more hours. When I awoke, I was pale, weak and my digestive system felt out of whack. I ate breakfast and then I took homeopathic Arsenicum to help my digestion while I scoured the internet for anyone having had a similar reaction. I found a guys blog from 2008, who spoke of being very ill for a week after getting skunked. At least I now knew I wasn’t crazy. But I was totally unwilling to suffer for more than a few hours, let alone a week. I spent the next 30 minutes reading a few other articles about animals getting skunked and their effects. 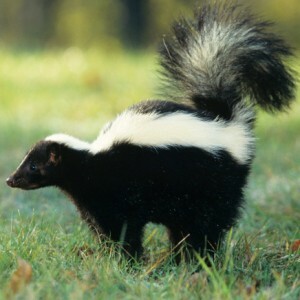 I noticed one article describing how toxic the sulphuric acid fumes of the skunk spray are to animals. This made me realize that taking homeopathic Sulphur might antidote the sulphuric fumes. I began taking homeopathic Sulphur and I immediately began to feel better. Two hours later, I felt I was almost back to normal. What a crazy way to start the day.